We're considering using Airtime for our new NCE FM station. I'm unclear on the working configuration for an Airtime cloud instance hooked to a live studio. Looking at the flow diagram in the Airtime docs here: http://en.flossmanuals.net/airtime-en-2-0/ , which components are clouded and which are local? Everything is local. The only potentially remote aspect of Airtime is you when you're using the Airtime web UI. EDIT: If you were talking about using our hosted solution Airtime Pro, then we take care of all the setup, and provide you with a stream that you need to simply patch through to your FM transmitter. In that diagram, everything in the square box is in the cloud. 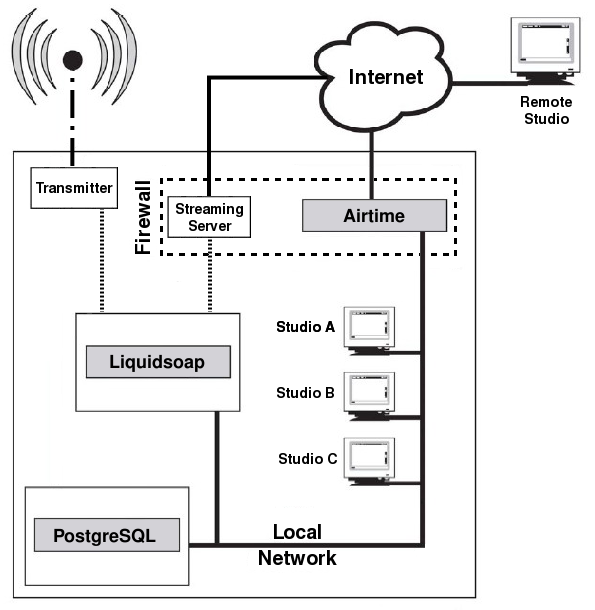 If you want to hook it up to your transmitter, you can use a program to connect to the stream output and broadcast it. You could use two output streams with different bitrate for your internet listeners and for your FM broadcast. Let us know if you want more clarification on this. One correction to what I said : in that diagram, everything except the transmitter is in the cloud. That seems fragile to me. Suppose there's a local power outage. A UPS or generator could keep the studio and STL up and working, but without the internet the station would be dead until all local services were restored. We're on the Oregon coast and blackouts are not uncommon. It also strikes me as a little inefficient (for mostly live as opposed to sequenced recordings programming) since there'd need to be a continuous info flow (audio & other data up, display and audio down). I'm no expert, I'm just thinking it seems odd to send a signal up and then bring it back down again to put on the air. You are quite right; FM stations in a single location with unreliable infrastructure should install Airtime at the station. We can provide support for that type of installation, such as the Airtime deployment at West Africa Democracy Radio in Dakar, Senegal. The cloud option (Airtime Pro) is mostly aimed at Internet stations with multiple show contributors in different locations. We deal with potential network outages at the production studios by enabling the contributors to upload their pre-recorded shows and playlists ahead of playout time. However, we can also synchronize the data between two Airtime servers, one at the station and one in the cloud, for maximum reliability. That means if your Internet connection is a little flaky, you can continue to stream pre-recorded shows from the cloud even when the lights are out at the studio. For live shows, you would send your mixer signal to the transmitter in the normal way, but use an aux send for the Internet stream. I agree that to put the Internet between the mixer and the transmitter would be inefficient, if the two pieces of hardware are in the same building. We also have a product called "Airtime Box" which is a server pre-installed with Airtime. This is reliable hardware that we know works well and is easy for us to service. You can buy a support package on top of that where we will handle your upgrades and maintenance for you. Reply to @Daniel+James:Thanks for the reply. Sorry for the delay... I've been busy. What sort of latencies are we looking at here? There's a local station (NPR affiliate) with a 'live' feed on their website, and a conventional FM radio signal. I usually notice a 1-5 second difference if I listen to them both at once. Also, which cloud do you use, and where would it be located, geographically? note: I listen over DSL. Broadband in our region of the US is pretty shabby. A lot of people outside of town are still using dialup. So internet access speed is not (yet) a trivial issue. Reply to @Paul+Baranowski: A virtual machine, e.g. VMWare? I can see how that would be eminently portable and robust. Well, I've been playing around with it some more. I've got it up and running in a Virtualbox instance. Can't get much more portable than that, I suppose. And, it seems to be working fine. So far. No torture tests yet. Is there some bumf outlining how to stream to an offsite icecast server? It seems to me to be the most logical way to run Airtime in the cloud while keeping the guts in house and on the ground. Is there a link to the "Airtime Box"? I couldn't find anything on the website and would like to know more about it. Also, I was wondering if there is detailed documentation other then the attached image in regards to hardware / software setups for stations interested in a non cloud based solutions. I'm interested in starting an all internet station that would be live 50% of the time and automated the other 50% of the time. Airtime seems perfect for automation but I'm having trouble conceptualizing the live portion and how Airtime fits into the picture. The testing I've done so far has included two machines, one for Airtime and one for "Studio A". The audio library is located on a USB network drive connected to the "Studio A" computer. The "Studio A" computer is running Ubuntu Desktop 12.04 LTD. I've mounted the network drive to Airtime and changed the Airtime library to a directory located on the network drive. When I want to broadcast live I use a tool like "Mixxx" to stream from the "Studio A" machine to the Airtime server. This seems counter intuitive to me since both machines are located in the same location. It also seems like there should be a way to cue songs from Airtime during live broadcast rather than using Mixxx and the shared library on the network drive. This way Airtime would know exactly what songs is being played because they are already indexed in the PostrgeSQL DB. Hope this makes sense and if you have any information regarding actual working hardware setups I would greatly appreciate it as it would be extremely helpful in wrapping my mind around how all this stuff works. Hi Ben, the Airtime Box is currently a custom-made item, based on the HP ProLiant Microserver, a very inexpensive and low-energy machine for running 24/7. You can use pretty much any recent server hardware for running Airtime, though. Personally I would store the main media library on the Airtime server, rather than your desktop, because the server is probably running 24/7 anyway. In your case the two machines may be in the same room, but they need not be. For example you may wish to move the server out of the live studio to cut down on background noise. You can cue files live in Airtime - just schedule a show with some empty time in it, then drop the files into the queue on the Now Playing page. You can also drop in pre-recorded voice tracks that way, in case you need to take a break. Mixxx is a better choice if you want to have full manual control (for example to mix dance music). Thanks for the information Daniel. Is there a specific sound card you use with the micro server? Hi Ben, any class-compliant USB audio interface should work with an Airtime server. You only need two output channels, and two input channels for recording live shows. There are plenty of audiophile USB interfaces out there, but most of those made for the hi-fi market don't have input channels. Personally I use an M Audio Mobile Pre (beware: not all versions are class-compliant), they go for about $50 used. An interface you might want to check out is the Focusrite Scarlett 2i2, it costs about $125 new in the US. I have not tested it with Airtime yet, but I hear reports that it works fine on Linux. PCI or PCI Express cards will often not fit into the smaller server cases - you usually need at least a 3U case to mount an internal card vertically. Also they are not as easy to swap over as USB devices if you have a hardware failure or need to upgrade. If you have redundant servers and two USB interfaces you have the option to use the backup USB interface for making recordings on a laptop, where phantom power and XLR inputs would come in handy, whereas a spare PCI interface will probably see little use.